Image Credit & Copyright: Stephen Mudge Explanation: On January 1, a Mars-assisted viewing opportunity allowed binocular-equipped skygazers to cross an ice giant off their life list. Remarkably, the line-of-sight to the bright Red Planet could guide you to within 0.02 degrees of a faint, pale Neptune in Earth's night skies. Taken within 3 hours of their closest conjunction, these panels capture the odd couple's appearance in skies over Brisbane, Australia. A wide field view includes the new year's slender crescent moon near the western horizon and Venus as the brilliant evening star. Mars and Neptune are indicated at the upper right. 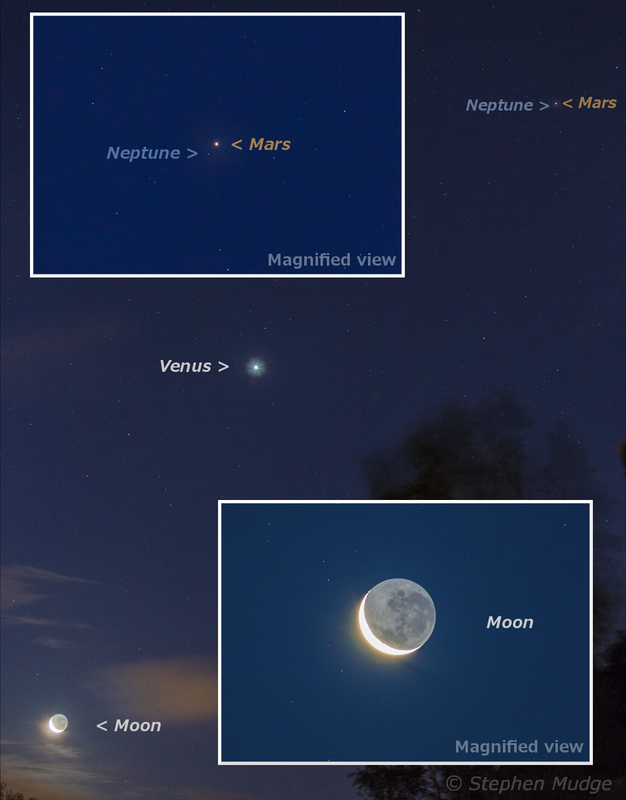 The two inset magnified views were taken with the same telephoto lens and so do show the Mars-Neptune conjunction and the apparent size of the crescent moon at the same scale.This week Neptune hangs out near Venus on the western sky.